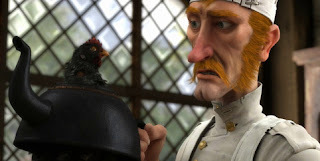 I've just picked up Fable 3 and I thought I'd sling down my early thoughts in a quick game usability evaluation for you all to enjoy (I haven't reviewed any of the other Fables here, so I'm taking some series staples and talking about them, as well as new features). Everywhere the player goes, a golden sparkly trail leads out from the player to their next quest location/objective, meaning the player knows where to go at any point. This trail is a great way to ensure the player can wander off and explore - safe in the knowledge that they can find their way back easily afterwards. Genius! For 2 reasons - it encourages exploration and ensures players don't waste time looking at maps, getting lost and generally not playing/doing what they want to do. Some players might feel that they're being handheld, that it removes some of the challenge. However you could counter this by saying that struggling with maps isn't one of the challenges the game designer planned, so anything that eases the pain should be encouraged. 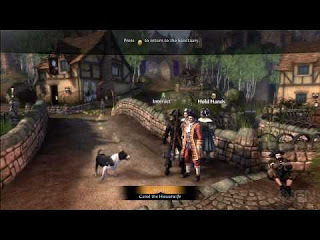 Fable 3 uses a simple levelling/skill tree process, avoiding the use of stats. This fits with the casual approach the game takes to the whole RPG genre. Most RPG games are very statistics heavy ("Take this 6-7 damage +3 poison damage thimble"). 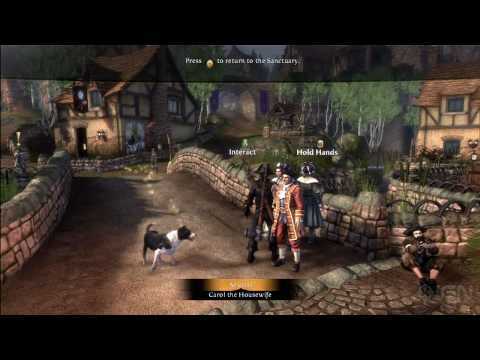 Fable 3 has taken an alternative approach. All levelling up is handled by opening chests which improve your various powers along the 'Road to rule'. This keeps all levelling simple, encouraging players to not think too hard about what to unlock next. One negative aspect of having physical chests is that they are spread out in this 'Road', and if left unopened can be a real trek away. I had a bit of a journey to get back from halfway down the road to the first set of chests (to unlock a spell I finally decided I needed). Chests aren't reliant upon players opening previous chests first before giving them access to the next level (e.g. you don't have to have opened pie making level 1 to open pie making level 2). The game simply rolls the costs of the 2 levels together, so the player can essentially unlock them both at once. This means the players don't have to hunt for the missing chest before they can open the shiney new one. The game has a very good sense of humour. This feels right, and fits with the game world. It has the added bonus of allowing much greater variety in the side quests, ensuring the quests remain fresh (the role play game and bickering ghost brothers being particular highlights so far). This is supported by an excellent voice cast. Notables include Dame Judy Dench, John Cleese, Stephen Fry, Jonathan Ross, Mark Heap and Julia Sawalha, among others... I could go on! Quality voicework can be found throughout the whole cast, and it complements the writing wonderfully (Although as a big radio 4 fan it's slightly disconcerting to hear voices from Nebulous and the Museum of Everything!). During loading screens, your statistics are displayed, alongside your Live friends stats. I know several other games do this, but this is the first time I've played a game at the same time as a friend. This creates surprisingly compelling pressure/competitiion to keep up/get ahead of your friend. It's sucked me in, that's for sure! The sanctuary is essentially the pause menu - the central hub where you can change weapons, game settings, join an online game, etc. The novel approach is that these options are controlled in physical 'rooms' - rather than through a menu. It's certainly... different. I remain to be convinced by it's gain in the user's experience. It takes longer to do anything, it's particularly difficult to change quests/missions, but at the same time I think it will be more easily understood then a system of menus by players new to the RPG genre. In short a very good game. Quality throughout, with some nice touches which could help new players pick up the game and get playing more quickly and painlessly than other games. Coming soon: The BAD. Poor design/development choices that I feel will interfere with people's enjoyment of the game.